The tradition of the Nativity Scene dates back to the Middle Ages: in 1223, having returned from Bethlehem, Saint Francis of Assisi made the first Nativity Scene in Greccio, an Italian town in the region of Lazio which he found to be similar to the Palestinian city in which Jesus was born. The idea was to share the story of Jesus’ birth with the poor and illiterate, who were unable to read the Bible. Saint Francis hoped the Nativity Scene would glorify the feeling of simplicity and humility surrounding the birth of Christ and convey a sense of devotion created by simple people for simple people. The nativity scene in Greccio was what people would today call a “live Nativity Scene”, featuring real people like those in Giotto’s depiction, which you can admire in the upper church of the Basilica of St Francis of Assisi. 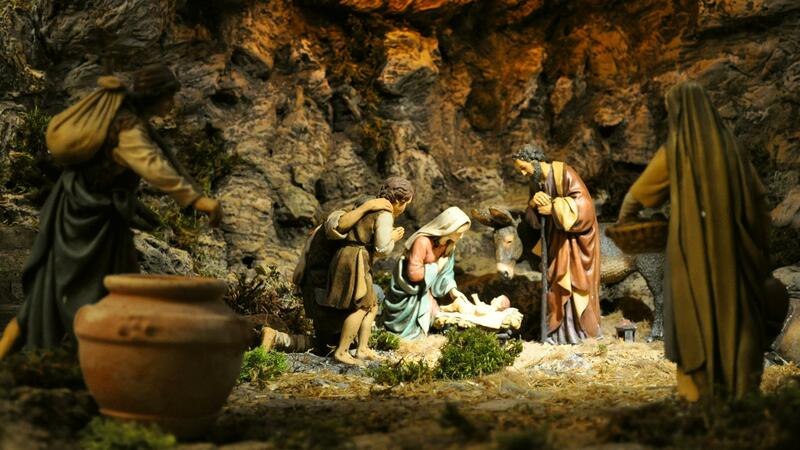 However, in the following centuries, it became more popular to use statues and natural objects to set up Nativity Scenes in churches, first in central Italy, then in the Kingdom of Naples from 1500. It soon became an integral tradition at Christmas time. Miniature Nativity Scenes also began popping up in homes in the 18th century, thanks to an invitation by Pope Paul III during the Council of Trent, in an aim to bring people closer to their faith. Although the Christmas tree (a symbol with pagan origins) is today the most popular decoration of the festive season, the tradition of the Nativity Scene is still alive and well, in its classic form and also in more modern adaptations, using mechanical statues and technical installations to create special effects. While a Nativity Scene can be as creative as your imagination will allow, there are certain key characters that simply can’t be left out because of their symbolism. Joseph and Mary are the archetypical mother and father. Joseph is dressed in dark, modest colours, underlining his devotion and submission to the Divine Will. He also represents a protective figure to Mary and Jesus. Meanwhile, Mary is dressed in sky blue, and symbolises an ethereal and delicate spirituality and a maternal sweetness. She represents a mother worshipping the fruit of her own womb, as well as a loyal servant. perhaps even in pagan traditions. The first case refers to the words contained in an ancient prophecy by Isaiah suggesting that Enlightenment would come in the form of a baby. The donkey represents pagans, while the ox represents the wise, both of which are incapable of embracing faith because they’re blinded by either a lack of or an excess of knowledge. While neither the stable nor the cave (grotto) appear in the canonical Gospels, the cave is present in the apocryphal Gospels and is an ancient cosmic symbol linked to birth in many Middle Eastern communities. The shepherds represent humankind welcoming the birth of Jesus: they were the lowliest, humblest and poorest among society. According to the Gospels of Luke and Mark, Jesus chose the shepherds to be the first witnesses of His birth. This character is perhaps connected to the figure of Peter and his being known as the “fisherman of souls”, or to the symbolism of fish, used by the first Christians. This figure is a symbol of purity and purification, similar to that of the midwife in Eastern tradition as well as that of Mary, who was called on to attest to and glorify her virginity. Like the fisherman, the representation of the washerwoman requires running water, which is an essential element in every Nativity Scene. Legend has it a young virgin wished above all to see Baby Jesus, but the angels kept her at a distance, as it was forbidden for unmarried women to approach a woman in labour. So, the woman came to the cave carrying a large rock wrapped in a blanket, making it appear as if she had a baby in her arms. In the presence of the Holy Family, the stone started to move and then turned into a real baby. The tavern and its occupants represent an infernal place, where humanity expresses its weaknesses and vices, excesses and unruliness. Traditionally, the tavern symbolises a tempting devil who would like to distract those present from the contemplation of the Nativity. On the other hand, the tavern also offers bread and wine, symbols of the Eucharist. fate of men according to rules that are beyond our control. Each of the Three Wise Men (or Magi) has a distinct significance. Balthazar, symbol of the night, bears a gift of frankincense which represents the divine nature of the Christ child. Caspar, symbol of daytime, offers the Infant a gift of gold as acknowledgement of His kingship on earth. Lastly, there’s Melchior, symbol of the dawn, with his gift of myrrh to represent Jesus’ dominion over time and death. The character of Benino is asleep and unaware of the event taking place. However, legend has it that he is not only dreaming of the Nativity Scene, in which he is a participant, but will actually make it a reality. He is a figure full of powerful and ancient symbolic meanings, and embodies the revelation of faith. He’s usually placed in the shade of a tree or a haystack. A Nativity Scene isn’t complete without artisans and merchants. The most popular are the blacksmith, the carpenter, the fruit vendor, the grinder, the baker and the butcher, and they are positioned near the cave as if to make offerings to the newborn King. This story appeared in the 2018 edition of Natale - Christmas Magazine.